SWF(Shock Wave Flash) file format is widely used for displaying animation or vector graphics,with different degrees of interactivity and functions.Adobe products such as Flash,Flex Builder and Open source Ming Library is used to generate SWF files.If you are not able to play swf file on Ubuntu 10.04 then here is an simple solution of that.Gnash SWF player is recommended for playing SWF files on Ubuntu 10.04 Lucid Lynx. 1.Open Ubuntu Software Center(Applications->Ubuntu Software Center) or SPM(Synaptic Package Manager) from System->Administration->Synaptic Package Manager. 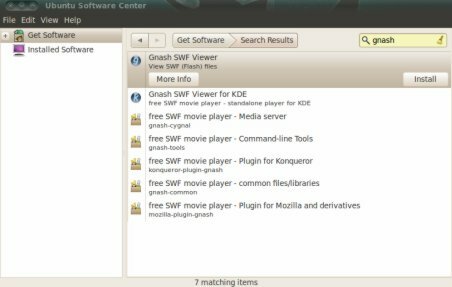 2.Search for Gnash and click on Install(in USC) OR mark for installation,then apply to install gnash(In SPM). 3.Installation,followed by downloading process will complete within few minutes…….